Introducing the Moulin Roty Mademoiselle Mouse Comforter featuring the little mouse from the Mademoiselle et Ribambelle range, the comforter has a square 'blanket' surround made from soft velour and lined with jersey. 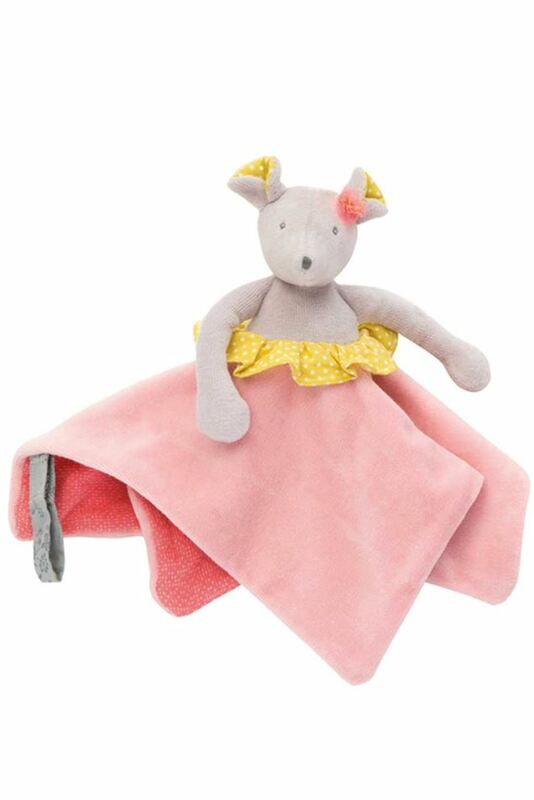 This oh so pretty comforter from Moulin Roty's 'Mademoiselle et Ribambelle' range, features a mouse in softest grey, yellow polka dot inner ears and matching frill from her middle, under which is a lovely full square skirt, in soft pink velour. There is a loop on the skirt so that she can be safely taken everywhere and she also has a fuchsia pink tuille flower by her ear.